Alonna Shaw: Wellness Ingredient: Broth or Stock? Spring brings thoughts of reorganizing from the ground up. Gut health is the body's foundation. Years ago I was being treated by a naturopath. She recommended homemade bone broth from grass-fed beef to improve my gut lining and general health. The amino acids it provided would help reduce inflammation. Canned soups weren't an acceptable short cut. Browned bones simmered for hours create and preserve these health benefits. 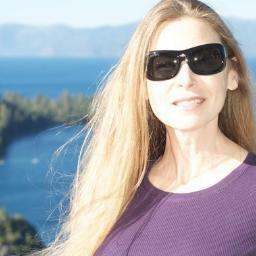 The source was relevant because I needed to avoid grain-fed issues, antibiotics, hormones, pesticides, etc. which can be part of the commercial beef and poultry industry. "Real cows eat grass—not grains."—Dr. Mercola offers a quick overview. Recipes vary like the people who make them. Stock or broth has always been a way to prevent waste and use everything. My take: Stock uses bones and supplies healthful gelatin, and is considered an ingredient in other things. But if you add a bit of salt, now stock crosses into the broth label because it becomes something enjoyable on its own. Sip a cup of broth instead of tea for an afternoon beverage. 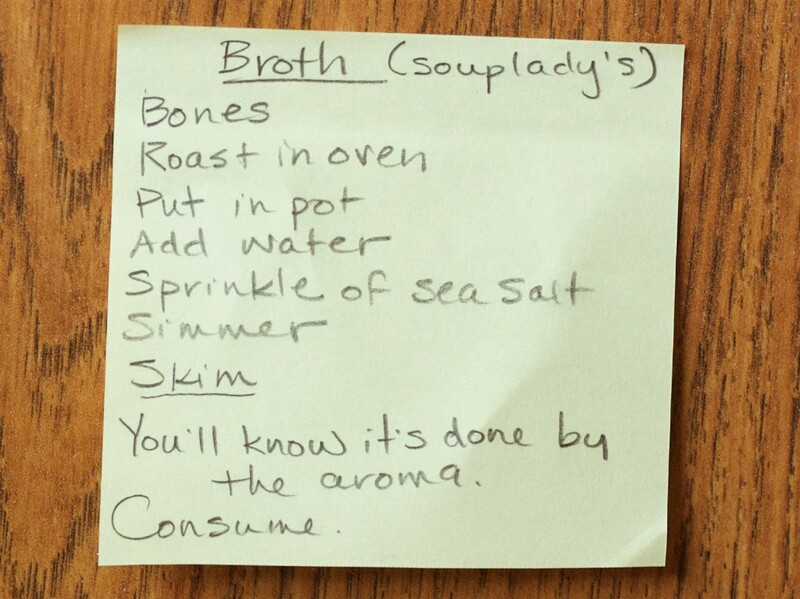 Broth is generally made from meat scraps, vegetables, and seasonings. My broth is a combo from roasted marrow and knuckle bones, short ribs, meat, and water with some sea salt. Macrobiotic cooking classes taught me about having a calm heart when preparing food and since I'm right handed, to stir counterclockwise. Our energy goes into the food. If upset or stressed, it was suggested to take a short walk before cooking. Attitude and stress levels can have a negative effect on gut performance. The souplady in my novel, Eleven Sundays, serves a restorative brew to those who need it. 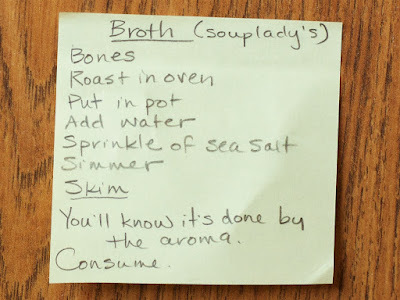 She starts with the same basic ingredients available to anyone, but adds attentive skimming never allowing the foamy scum to loiter at the surface of the broth. Richness of taste develops by removing this tainting layer. She adds shelled pea pods right at the end of the simmering time. She wouldn't waste anything, so in they go. Healing properties have been attributed to this magical pot of brew. I come from a long line of soup makers. Growing up my mom made the best pot of soup! 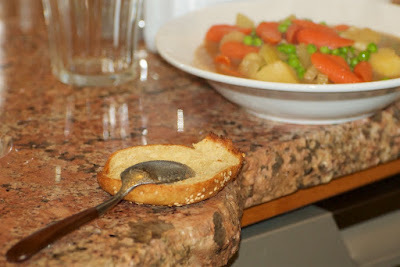 She cooked up a bone-with-cabbage-carrot-onion broth for the base, then added veggies, barley, salt, and pepper. When I think of soup, this is the soup that warms me. 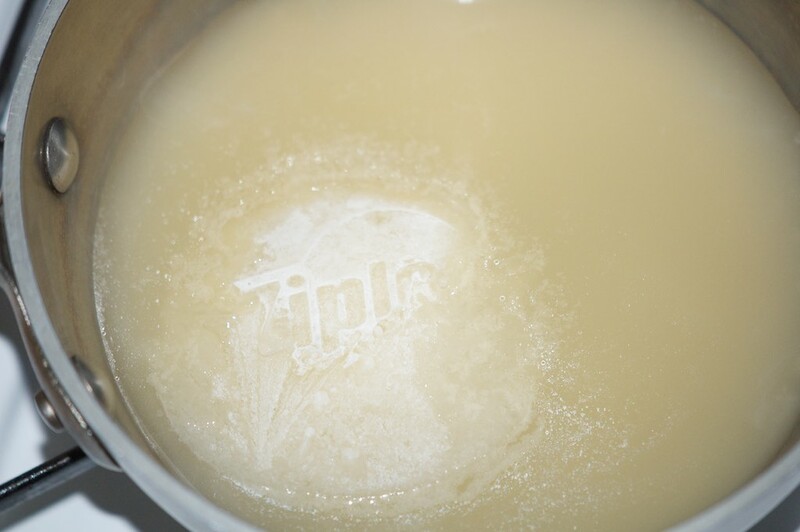 Broth is a handy base to store in the freezer. Homemade soup can be quickly prepared by chopping up some veggies, toss into thawed broth, and cook til tender. Add bits of leftover rotisserie chicken. Tip: An organic rotisserie chicken can supply a variety of meals. I remove the skin, save most of the meat for meals (with mashed potatoes, or in sandwiches, tacos, pasta, chopped salad, etc. ), and put the bones in a pot for broth. I don't add anything but filtered water and a little sea salt. This way I have a plain base without garlic, onions, or any other strong flavor. I'm allergic to garlic, but there's a benefit to a simple base--it will work with more recipes. Ever notice how almost everything has garlic in it? You'd be surprised where you'll find garlic--it's sneaky and can be listed as spices. Cool before transferring to single-serve, freezer-safe containers. If it jiggles when cold that's a good indicator of gelatin success.